I know Typepad has been experiencing problems, but when checking my statistics I have had 1000 page hits evaporate this evening. I went from 16,400 to 15,400 in an instant. Was this some sort of Daylight Savings for page views? Update: No sooner did I send an inquiry my old number returned. Strange. On their shoulders, I mean. Grow up. Seven years after Pfizer made Viagra a cultural touchstone and commercial blockbuster, the market for impotence medicines appears to have fallen well short of what was once predicted. Or maybe they were afraid they’d end up looking like Bob. Or, maybe it’s because football season is here. Blogrolling has always been been a bit of an enigma to me. I mean, do these people with blog rolls a mile long really read all of them? If so, how do they eat? My brother in arms Andrew Clem has a roll that I am certain he reads often. Andrew and I began to correspond about baseball years ago (we’ve even had cheese steak at a Phillies game this past opening day) and I enjoy his thoughts immensely. He also fills in the gaps for me by blogging about things I meant to write about but didn’t, especially baseball. One thing a blog should have is commentary. People who mail it in every day and link to Instapundit and Michelle Malkin drive me nuts. Malkin, by the way, at least tells you whats on her mind. Glenn Reynolds has become Drudge in a way- he either has a staff patrolling the ‘net or he gets hundreds of emails a day and if you are lucky you’ll get posted. But interesting commentary? Bah. At least he posts his column though. Being de- bloggrolled is the Bull Moose Republicans. Last post: 10/26. The guy has either lost his inspiration, got a high maintenance girlfriend, or both. This is my 2nd time with this site. It is a fantastic idea, but like all good ideas it means nothing if you don’t follow up. Everything else in my "blog" category I read regularly. I know there are ways to get feeds and updates efficiently but for now I surf from my IE’s bookmark list. When I get the time I’ll install a newsreader or whatever these people have now. It has been just about a year since I began this project, and it has kept me sane. I’ll admit to whoring myself slightly for traffic, but by and large I’d do this anonymously for the cathartic value. 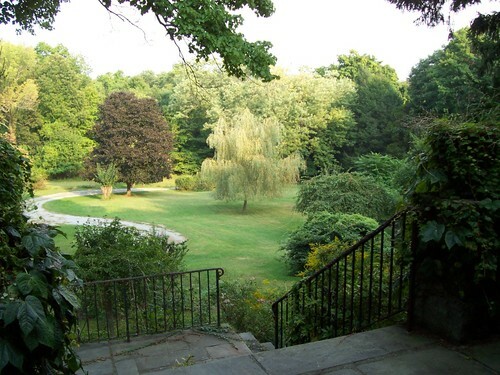 Today was the first snowfall here in Westchester County, so I will leave you with a Summer image taken from the front door of a beautiful property I have listed for sale.